Last night we had to say goodbye to our dear friend and office mascot, Hudson. We will all miss the thumping sound of Hudson’s tail on the carpet upon our entry into the office and his resting head on our laps during meetings. 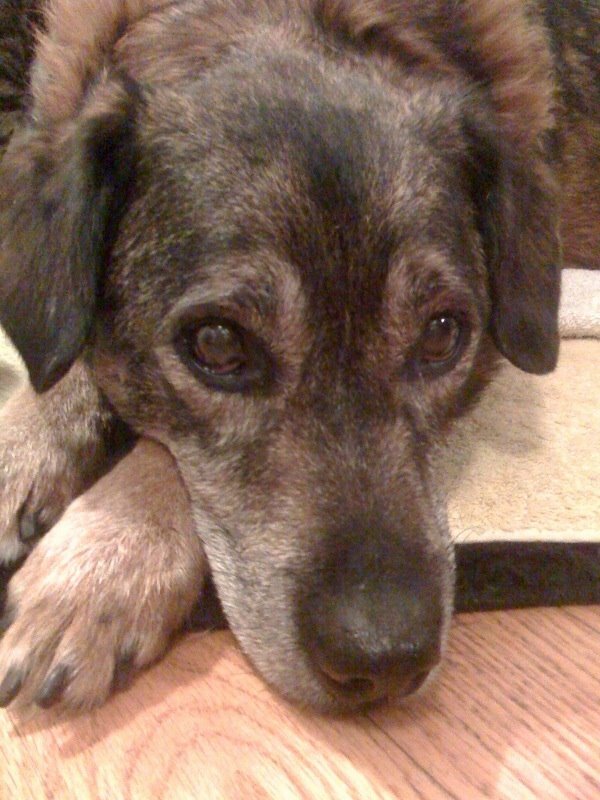 He was truly a sweet, loving dog who was ready for a walk or a hike at the drop of a hat. Hudson’s story is unique and quite fitting of ECOBAGS’ principle of making the best of what you have rather than buying something shiny and new. He was found on the streets of our town nearly 10 years ago and, at 5 or 6 years old, was definitely a diamond in the rough. He was aggressive at first, “tasting” a few family members, but the Rowe family saw his potential and were committed to rehabilitating him. After years of work and professional training, he became the best pet a family could ever want. He had finally found his pack among his cat-siblings B.B. and Rhythm, human-siblings Eva and Julian, and pack-leaders Blake and Sharon. Our thoughts are with the Rowe family and all who had the privilege of meeting our dear mascot during his full and happy life. We used to joke that only Sharon and Blake would get a used dog with so many bad habits and have the patience and love to reform him. Hudson was a scruffy dog who intimidated us at first…with good reason…and then emerged as a lovely family pet who was always game for a good hike. He got along with all the family pets and most of the family members 🙂 and he loved to cuddle on the couch and watch TV. He was a “buddy” in the true sense of the word. I am the only one who never fed him, yet he laid his head in my lap every time I had lunch. He made it easier to be away from my own furry friend for so long while I lived in New York. Curtis and I will miss Hudson’s energy and sweetness. Once he bit both of us we all became good friends.Hudson’s bark made dragging one’s nails on a chalkboard sound like a symphony.He could sleep in like a champ or rally for a Sunday walk any time. Hudson took a few nibbles out of our dog in his early days. We were all leary of him then and couldn’t understand how Sharon and Blake could keep him after he bit Eva. Wow, what love, patience and a doggy shrink can overcome! Always remember… Woodstock, his high pitched bark, hikes, the image of his high-jump to look out the back door window, taking a stick from a young girl and knocking her into the lake fully clothed! You were a great dog. We will miss you Hudson. he didn’t really bite that many people, did he? I miss the daily walks with Sharon and Hudson. Watching him roll in the grass in the Summer and the snow in the Winter always made me smile.